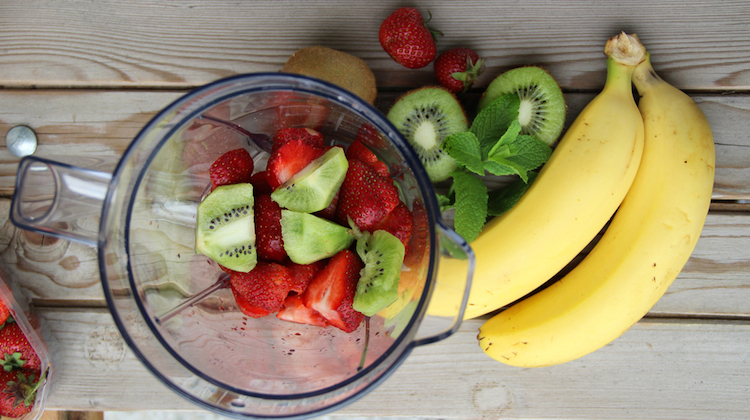 You scored a great deal on a new blender. You’ve just taken you new, 3-speed Ninja NJ600 out of the box and found a perfect place to place the 6-blade, crushing machine on your counter, but now what? There are a few things you should know before jumping in to make that perfect smoothie, chopped salad or margarita. The first thing, as a new owner of the Ninja NJ600, you will want to do is to plug in the blender. The 2-foot long cord, which many not be visible right away, is located in the back of the blender in a “stuff box” where the cord can be hidden to avoid clutter on your kitchen counter. Locate the box, simply pop it open and plug in the cord. Next, you will want to snap on the BPA-free, 72 oz pitcher and stainless steal blade. It is important to note that the blender will only work if the pitcher is in the locked position. The manufacturer made it simple for you to detect if attached correctly — a red light on the blender’s base will blink if the pitcher is not in place and will remain solid if it is in the right position. Unlike many blenders where you can blend without a lid in place — setting yourself up for a big mess — the Ninja NJ600 comes equipped with a lid that features a handle that must be snapped into place before the blender will work. To attach the lid, simply line up the lid and handle arrows before locking the lid in place. With your Ninja NJ600 set up and ready to go, you should take note of the various settings on the blender. The Ninja NJ600 comes equipped with three speeds: Speed 1 for mixing, Speed 2 for blending and Speed 3 for ice crushing. The blender also comes equipped with pulse-control, which will assist with processing and chopping. While your blender can help you to chop and blend vegetables and fruits into delicious and healthy drinks, it should be noted that the NJ600 is not a juice extractor, which separates pulp, so be sure to add a liquid, such as water or milk in with your drink concoctions. Since the Ninja NJ600 is so versatile, there are a number of recipes, including ones for smoothies, ice cream, but butter, soups and salads that you can make with it, so be sure to have fun trying out a variety of recipes, including the ones that came with the blender. Additional recipes can be found at online at Ninjakitchen.com or in the New York Times.com fitness and health section. With every new appliance it is important to note cleaning and care information — after all, you want your new Ninja NJ600 to have a long life span. NinjaKitchen.com states that the NJ600 pitcher, lid and 6-blades are made to withstand the dishwasher. The blade and lid, however, should always be placed on the top rack. The blender, the company said, should also never be placed in a microwave. If for some reason, your NJ600 will not blend, chop or crush, it is recommended to first ensure that the appliance is plugged in and the pitcher and lid are secured correctly. If you still aren’t able to make your mouthwatering recipe, check to make sure that you have not overfilled the pitcher — remove a portion of the ingredients and try using the blender again. The blender also comes equipped with thermal protection, which could have been activated. In that case, unplug the blender, wait 15 minutes and plug back in. If for some reason, your blender is broken, Ninjakitchen.com does offer a one-year guarantee, but it is important to register your blender after purchasing it. Replacement parts can also be ordered online. Blender image courtesy of Shutterstock.